There’s still a war going on in Europe and Russia is being… well… Russia. 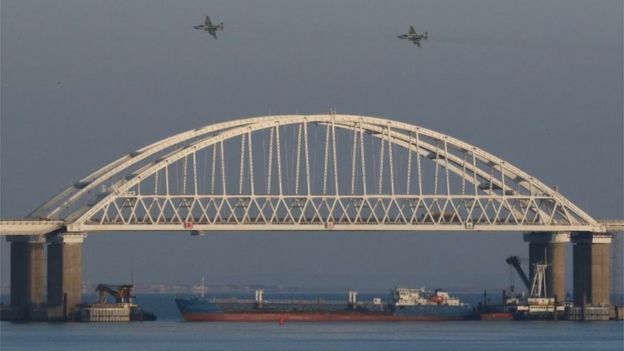 The Russians placed a tanker under a bridge in the Kerch Strait – the only access to the Sea of Azov, which is shared between the two countries. Remember that these are sanctions that the Democrats supported. Will they stand by Trump now? China has told the US to withdraw sanctions on its military over purchases of Russian jets and missiles or “bear the consequences”. The US says China has contravened US sanctions on Moscow introduced over Russian actions in Ukraine and alleged interference in US politics. Its forces took part in giant Russian war games held earlier this month. Washington (CNN) Russia appointed actor Steven Seagal as a “special representative” on US-Russian humanitarian ties, the country’s Ministry of Foreign Affairs said in statement on its official Facebook page Saturday. It was the victory rally he never doubted he’d join. Two hours after the last polling stations in western Russia closed, Vladimir Putin strode on stage beneath the Kremlin walls to declare his re-election. This was an election with eight candidates but one clear winner from the very start. Russia’s most popular opposition politician Alexei Navalny had been excluded and a communist candidate was vilified by state-run media. The society-girl-turned-activist Ksenia Sobchak ran her entire campaign on the basis she would lose. It appears that Putin is just sending out assassins to murder people all over the world. I doubt that this activity actually moved any votes, but I’m glad that we are taking actions to punish foreigners who committed crimes while trying to interfere with an American election. The indictment says those involved systematically measured how well their internet posts were doing and adjusted their strategies to maximise effectiveness. That’s some good trolling there. Washington DC has renamed the street the Russian embassy sits on after a murdered Russian opposition politician. The city council voted to rename the street outside Russia’s embassy complex after Boris Nemtsov, who was shot outside the Kremlin in 2015. A statement from the council said the decision to honour the “slain democracy activist” passed unanimously. Harry Hopkins was an energetic and tireless social worker who helped shape much of the world as we know it today. His work in New York in the early 1930s attracted the attention, and then the friendship, of New York Gov. Franklin D. Roosevelt and his wife, Eleanor. When Roosevelt moved to the White House, he called upon Hopkins to be one of the principal architects of the New Deal. Throughout the decade, Hopkins grew to become one of Roosevelt’s closest advisors and was probably the most influential person throughout Roosevelt’s administration except for Mrs. Roosevelt. When World War II began, Roosevelt called upon Hopkins again to be Roosevelt’s personal emissary in high-level diplomatic discussions with Britain and the Soviet Union. Hopkins was appointed to administer the famed LendLease program and was a permanent fixture in the White House throughout the war. One aspect about Hopkins’ work during the war had sought explanation from historians. He was energetic and consistent about advocating for the Soviet Union even to the detriment of the U.S and other allies. Hopkins greatly directed Lend-Lease resources to the Soviets, strongly pushed Stalin’s demands for a second front, dismissed the fact that the Soviets massacred 22,000 Poles in the Katyn Forest, and generally tilted every scale he could put his finger on in favor of the Soviet Union. The fall of the Soviet Union and the release of many of the Soviet archives has begun to offer some explanation for Hopkins’ behavior. He was almost certainly a Soviet agent. The only real remaining question is to what extent. The first indication came when Oleg Gordievsky, a senior KGB defector, recalled a lecture in which another KGB office bragged that Hopkins was the Soviet’s most important agent during the war. The confirmation came when New York Senator Daniel Moynihan forced the release of The Verona Papers — a trove of decades’ worth of coded messages from Soviet agents in the U.S. to Moscow. Those documents revealed a message from Agent 19 to Moscow about a highlevel conversation between the Western Allies. Scholars have deduced that Hopkins was the only person in a position to share the details of that conversation. The evidence points to the fact that Hopkins was not just a zealous friend of the Soviet Union, he was an active agent for their interests. We do not want to think that there was a traitor so close to the central nervous system of American power — especially during war. We do not want to think that Joseph Stalin’s hand was at work shaping American policy. But facts are facts whether we want to believe them or not. It took half a century for the facts about Hopkins’ treachery to come to light. Evidence of another high-level treachery is coming to light much sooner for former Secretary of State, Hillary Clinton. ■ Former President Bill Clinton was paid $500,000 in 2010 by a bank controlled by the Russian government for a 90-minute speech to Renaissance Capital in Russia and then had a meeting with Vladimir Putin. This happened right after Secretary of State Hillary Clinton had been in Russia and was actively working on a variety of follow up items for Russia after those meetings. ■ One of the issues Hillary Clinton worked on was her department’s approval of a deal whereby a Russian nuclear company purchased a Canadian uranium company to control 20 percent of America’s strategic uranium reserves. ■ Around the same time, a Canadian uranium magnet involved in the deal donated about $145 million to the Clinton Foundation, whose main purpose has been to support the Clinton’s lavish lifestyle rather than any meaningful charitable purpose. ■ Another issue was for another Russian company that used to sell recycled uranium to the U.S., but needed a new market as their deal was ending. ■ A third issue was to arrange for a group of venture capitalists from Silicon Valley to travel to Russia to look for ways to create a Silicon Valley in Russia. ■ Also in 2010, the FBI broke a Russian spy ring that had been trying to get access to the State Department for a decade. They had recently gained access to Secretary of State Hillary Clinton through a Democratic donor before the FBI arrested them. ■ Since 2009, the FBI had also been investigating a huge bribery and kickback program inside a Russian nuclear energy company with a division in America. As part of that investigation, the informant overheard numerous conversations from Russians about their efforts to influence the Clintons. A kind, if naïve, reading of these facts might excuse them away as independent and unrelated events that were each conducted with the utmost propriety. After all, we do not want to believe that there could have been someone working for the benefit of the Russian government at the highest level of our national government. But at some point, the accumulation of facts point to only one reasonable conclusion whether we want to believe it or not. Are the BLM folks all just Russian puppets? Meanwhile, the Tsar is locking up the opposition. A Moscow court has ruled that Russian opposition leader Alexei Navalny should be jailed for 30 days for staging an unsanctioned rally in Moscow. The anti-corruption rallies called for by Navalny were held in more than 100 Russian towns and cities on Monday. In Moscow, thousands of angry protesters held an unsanctioned rally on Tverskaya, the capital’s main street. More than 1,000 people have been arrested across Russia. The judge at the Simonovsky district court ruled after midnight Monday that Navalny should be jailed for repeated violations of the law on public gatherings. Well, that’s going to make cabinet meetings awkward. “The Treasury Department will not be issuing waivers to U.S. companies, including Exxon, authorizing drilling prohibited by current Russian sanctions,” Treasury Secretary Steven Mnuchin, said in a statement Friday. Mnuchin said he consulted with President Trump on the decision. Exxon had applied for a waiver from sanctions imposed by the Obama administration in a bid to resume its lucrative joint venture with Russian state oil giant PAO Rosneft. In a statement, Exxon said “we understand” the decision by the Treasury Department. Exxon explained that its application for a license was aimed at meeting the company’s “contractual obligations” in Russia, where competitors are allowed to drill under European sanctions. The move showed the UK has no “real influence” over world events, Russia’s foreign ministry said. Mr Johnson said events in Syria had “changed the situation fundamentally” and he would go to G7 talks instead.